What’s the first thing you think about when you think of NASA’s space shuttle program? Sally Ride? Spinning in microgravity? The Challenger explosion? That episode of the Simpsons? You might not think about the US military and intelligence community launching spy satellites, but you should. 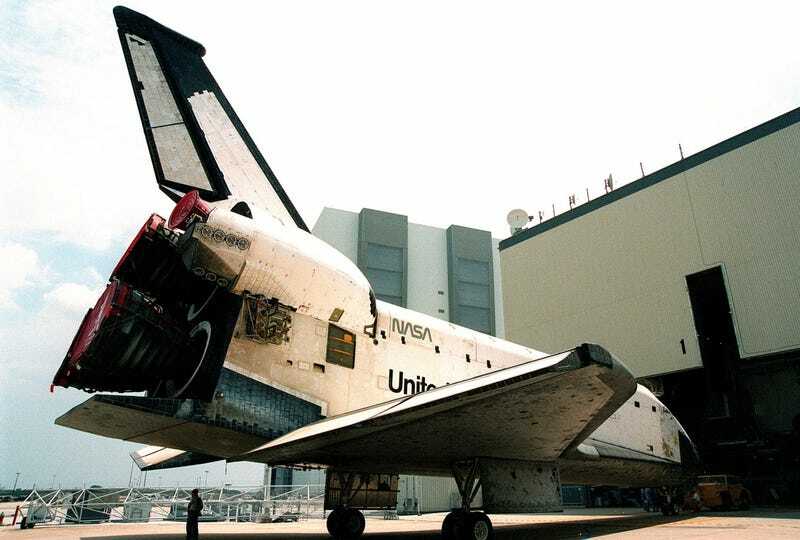 NASA’s shuttles were designed specifically to carry US spy satellites to orbit. And we got our hands on a newly declassified document about the top secret plans. Before you get too excited, all the juiciest bits are redacted. I filed a Freedom of Information Act (FOIA) request for the document with the National Reconnaissance Office (NRO), and it leaves way more questions than it answers. But it’s precisely those redactions that make it such an interesting document. The 17-page document is titled “Declassifying the ‘Fact of’ the NRO’s Use of the Space Shuttle as a Launch Vehicle.” And it’s exactly what it sounds like. The document, which I’ve uploaded to Scribd in its entirety, was produced in July of 2001 to determine whether the highly secretive National Reconnaissance Office should even acknowledge that it not only regularly used the space shuttles to launch spy satellites, but that it helped design the shuttles for this purpose. The NRO isn’t as well known as the CIA or the NSA, but the agency plays a pivotal role in keeping an eye on the planet for America’s intelligence community. They’re the folks that keep tabs on the entire planet from above using more advanced cameras and satellites than civilians could even dream of. Officially, the NRO’s budget is a secret, but it’s estimated to be at least $10 billion per year. The document I obtained through a FOIA request was produced in 2001, but there was no announcement made about any of it at the time. The entire purpose of the document, as you’ll see by the end, was to basically address what would happen if this information ever became widely known. It wasn’t until a decade later that it did, as the existence of NRO satellites launched by the shuttle, like the Hexagon, were declassified. But the American public is still largely in the dark about how NASA is used for spying and military purposes. Following analysis of key risk areas, the declassification of the “fact of” NRO’s use of the Space Shuttle as a launch vehicle is an appropriate result of evolving classification policy. All related programmatic data, however, should maintain appropriate classification. No other information beyond “fact of” should be declassified. Everything from engineering data, to operational data, to management data was to be withheld and areas where this document gets near those subjects are redacted. But the brief summaries about NRO and the military’s deep involvement with NASA are interesting nonetheless. Air Force and NRO officials participated in the design of the Shuttle throughout the 1970s, in particular the sizing of its manned orbiter payload bay to accommodate anticipated spacecraft growth. The Air Force also contributed funds to its development during this time. The Space Shuttle was expected to meet the launch requirements of both NASA and the Department of Defense (DoD). In January 1977, President Ford’s departing Deputy Secretary of Defense Clements executed a “NASA/DoD Memorandum of Understanding” that pledged the Defense Department to use the Space Shuttle as its “primary vehicle for placing payloads in orbit.” President Carter’s incoming Air Force Under Secretary, Hans Mark, who favored plans to use the Space Shuttle as the primary launch vehicle for National Reconnaissance Program (NRP) payloads, further reinforced this sentiment. But it’s not long before we get to the stuff that’s still classified. For instance, the date when the NRO launched its first satellite on the space shuttle? Redacted. It’s during this period that it becomes clear, despite the redactions, that things had gone wrong with the US military’s plans to use the space shuttle as a dependable way to get assets into space. The NRO and Air Force clearly have to start making alternate plans, which is something that James E. David’s 2015 book Spies and Satellites touches on in some detail. The next few pages raise questions of everything from the consideration of foreign arrangements and treaties to the possibility that people will start submitting Freedom of Information Act requests to unmask the details of these programs to put spy satellites in space using what was ostensibly a civilian agency with a peaceful mission, NASA. The fact that military and intelligence community personnel were working at NASA is also a sensitive subject. In fact, a portion of the document refers to “ongoing efforts,” which you can be sure are still part of virtually everything America does in space. The document ends by explaining that the NRO won’t be releasing any kind of statement about the fact that it’s declassifying the existence of spy satellites launched by the shuttle program. But it does have a guide for public relations. Q: To what extent has the NRO used the National Aeronautics and Space Administration’s (NASA) Space Shuttle to launch reconnaissance satellites? A: The NRO has used the Space Shuttle as a launch vehicle. This was in accordance with national space policy of the time. Q: Which Space Shuttle Missions carried NRO payloads? A: That information is classified. Q: Why can’t you explain details of NRO’s use of the Space Shuttle? The NRO announces today’s launches? A: The NRO, with certain exceptions (Corona, Argon, and Lanyard) has not acknowledged any of its launches prior to December 1996. Q: How extensive is the NRO relationship with NASA? A: In addition to the NRO’s past use of the Shuttle as a launch vehicle, the NRO, NASA, and USSPACECOM representatives convene regularly for Partnership Council meetings to discuss issues of mutual interest. Q: Does use of the Space Shuttle mean NASA plays an active role in intelligence operations? You can read the entire document here. With any luck, we should get those redacted parts in 50 years or so. But for now we’re left to try and read between the lines and figure out what happened where and with whom. Sometimes I feel like if I stare at the redacted portions long enough they’ll just peel off and reveal themselves. A guy can dream, can’t he?